Yellowstone won't carry these--only available here. 2 Posters $100 Limited edition of 1000 sold as numbered pairs and signed by Ranger Doug. Geyser Only $50 Limited edition of 1000 sold as numbered pairs and signed by Ranger Doug. 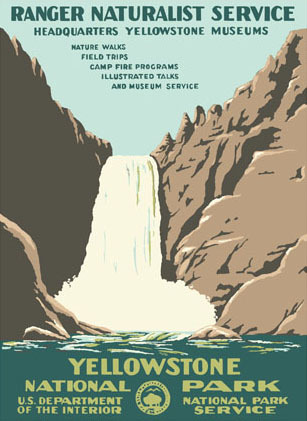 Waterfall Only $50 Limited edition of 1000 sold as numbered pairs and signed by Ranger Doug. 13 5/8” X 18 1/2” serigraph print--historic design & colors. 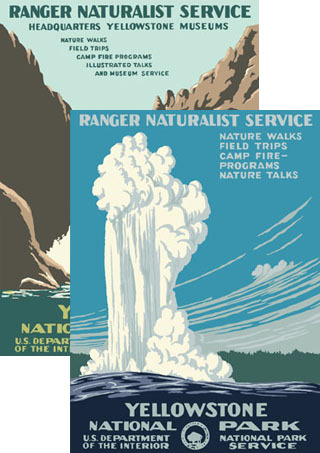 The NPS Centennial (1916-2016) kicks off next year and to celebrate, Ranger Doug is offering these two prints as a paired-numbered limited edition set of 1000 signed by Ranger Doug himself! What’s so special about this edition? I found these two original prints last year and they are now on exhibit at the Department of the Interior Museum in Washington DC until the spring of 2015. While in my (brief) possession, I faithfully copied the screens, corrected the parallax and colors and we now offer these two classics for only $100, with $25 donated to the National Parks Foundation. Never before (and again after the 1000 are sold) will I include the screen printer’s initials “EM” in the DOI seal—hastily scratched just before the printing process began in 1940 (WPA artists couldn’t sign their works). 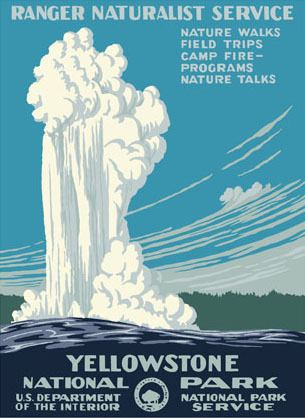 Celebrate the NPS Centennial--$100 for 100 years! 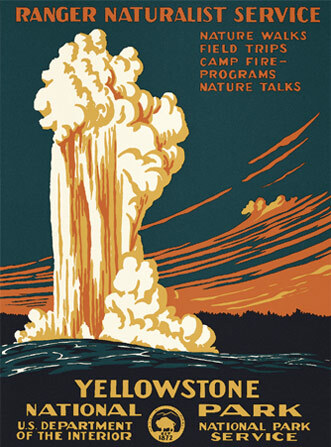 Only five copies of the original Yellowstone Geyser prints have been discovered to date and only one exists of Yellowstone Falls. To my surprise, it, like the Geyser print, has six colors. While supply lasts.